Water spinach is quickly becoming my favorite vegetable of the moment, beating out even my old favorite garden-grown lettuce varieties. I only wish I discovered it years ago. Although I may have had it as part of stir fries at Asian restaurants when I ate cooked food, I had no idea that water spinach was so ridiculously tasty raw, as well as incredibly easy to digest. My friend, Stephen, a raw foodist and permaculture practitioner, recently introduced it to a gathering of raw foodists in Chanthaburi, Thailand, that I was attending. I've since used it for a replacement for lettuce in salads as well as for a stand-alone munching food. One of the reasons so few people will know what you're talking about when you bring up water spinach is that it goes by so many different names in English. The botanical name for it is ipomoea aquatica, but English has at least six words that are often applied to it. Below are some of the commonly used names. Take morning glory, for instance. That name is frequently applied to more than 1,000 species of flowering plants in the family Convolvulaceae. Swamp cabbage is also frequently applied to the "heart of palm," plant, which is also edible and commonly consumed in salads. I tear into some water kang kong and tell you a bit about it in the below video. Kang kong fits into a healthy raw food diet perfectly. Because many commertially-grown vegetables are not ideal for human digestion, raw foodists frequently concentrate their vegetable intake around easy-to-digest and nutrient-packed leafy greens. Alongside regular spinach, lettuce, and a variety of other greens, chinese spinach can help provide the large array of easy-to-digest nutrients we need to thrive in a tasty package that's a lot different than your average head of lettuce. Want Healthy Raw Dressings For Salads? You're unlikely to find a regular grocery store in the US or Europe that stocks water spinach. If you happen to be anywhere in Asia, just about every market carries it, but people usually aren't familiar with it in the west. The best place for you to buy water spinach in the US or Canada is at your local Asian supermarket (that stocks Asian produce). If you're in a big city, the local china town probably has a few places that sell it. 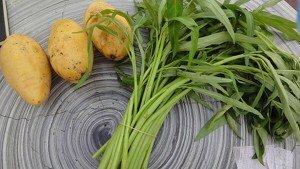 Water spinach grows best in water or very damp soil, and when farmed it's often grown in rice-patty-like conditions. One of the best and worst things about the vegetable is it's so prolific it often gets classified as a weed. On the upside, this means it grows extremely easily, and you can just chop it off just above ground level to harvest one and it will quickly grow back without you having to plant a new seed. The downside is that it has the potential to fill waterways in areas that do not experience frost, a fear that has lead the USDA to classify water spinach as a noxious weed, limiting the number of people who can buy the seeds and requiring that they have a permit. However, because there are so many names for the same vegetable, seeds often slip through US customs, and you can sometimes find them in Asian grocery stores on racks with other Asian vegetables. See how water spinach fits in with the foods you should be eating on a good raw diet. 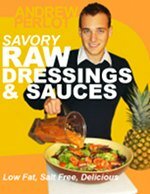 Learn how to make delicious and healthy raw dressings and sauces from simple raw fruits, vegetables, and herbs here.